TCI participant David O’Connor (left), fourth grade teacher from Inspired Vision Elementary in McKinney, Texas, learns how to age a tree from a core sample extracted by forester Ragan Bounds (right) with Hancock Forest Management. Texas Forestry Association (TFA) announced two sessions of its Teacher Conservation Institute (TCI) will be held this year at Bugscuffle Inn near Henderson, Texas. TCI is a week-long professional development workshop held in East Texas which uses the forest to teach environmental education. Activities are led by foresters, educators, natural resource conservationists and industry professionals. Phase I, A Complete Natural Resource Cycle, takes place July 10-14, 2017 and consists of interdisciplinary workshops focusing on the environmental, economic, and social well-being of the state that comes through the scientific stewardship of its forest resources. Sessions take place indoors, in the forest, and on a variety of field trips. Sessions include training in the Project Learning Tree supplemental environmental education curriculum, Tree Trails, GreenSchools Investigations, and evening natural history programs. Field trips for Phase I include a seedling nursery, family-owned Certified Tree Farm, timber harvest operation, sawmill, oriented strand board (OSB) Mill, and Texas Forestry Museum. Phase I participants receive certification in Project Learning Tree, 40 hours of Continuing Professional Education approved by the Texas Education Agency and 40 hours of Texas Environmental Education Advisory Committee (TEEAC) credit. Gifted and Talented credit may be grated at the discretion of participants’ GT Coordinators. Registration for Phase I, including all teaching materials and instruction, food, lodging, and transportation during the workshop is only $250. Those who have completed Phase I in prior years may elect to attend TCI Phase II on June 26-30, 2017. 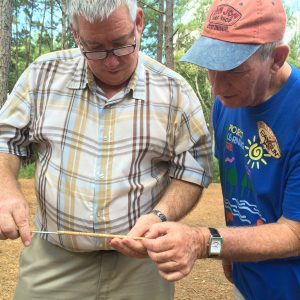 The theme of Phase II is Inquiry and Field Investigations in the Forest, and it provides a comprehensive look at East Texas forest ecology led by foresters, anthropologists, soil scientists, wildlife biologists and education experts. Participants conduct field investigations in water quality, best management practices, wildlife management areas and take an in-depth look at cultural impacts on the forest. Phase II field trips include the Texas Freshwater Fisheries Center, a red-cockaded woodpecker management area, cultural history sites, and the campus of Stephen F. Austin State University. Participants will become certified Project Learning Tree facilitators and will receive training in the Leopold Education Project and Project WET 2.0. Registration for Phase II, including curriculum materials, food, lodging, and transportation is only $300. To register or for more information, please call 1-866-TX TREES or email us at plttexas@texasforestry.org.